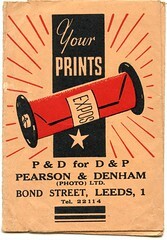 Pearson and Denham was a retailer of photographic goods in Leeds, UK, until some time in the 1960s. The company premises were in Bond Street, in central Leeds. The company was started in the 19th century; they only made cameras for a short time. The Loidis, about 1890: a double-extension half-plate (4¾×6½ inch) field camera, with rear focusing. Loidis, or sometimes Leodis, is the name of the Romano-Celtic settlement where Leeds now is. The Standard: a half-plate (or perhaps 5×7 inch) field camera. ↑ The most recent reference found to the company is this packet for negatives and prints ('P&D for D&P!') in Jane McDevitt's Flickr photostream. ↑ 2.0 2.1 The notes about the Loidis field camera, at Wood and Brass states that the company made cameras from about 1889 until 1909. ↑ 3.0 3.1 A picture of the back of the Standard is shown in this forum post on photo.net (the same enquiry was made on Large Format Photography). The camera is said to have a Dallmeyer Rapid Rectilinear lens. One respondent on photo.net suggests the company moved away from making cameras gradually, so some may have been made between 1910 and 1920. Photograph of a photographic exhibition of 1891 in the Leeds City Art Gallery, with a display case of goods by Pearson and Denham, presumably sponsors of the exhibition; at Leodis - a photographic archive of Leeds. Another display case, facing this one, showed goods by their competitor Reynolds and Branson. This page was last edited on 15 October 2013, at 00:49.